Responsible gun owners take gun storage very seriously and proper gun storage is one of our favorite gun safety rules. With this in mind, choosing a gun safe should be a prerequisite for anyone looking to start building a gun collection. In this article, we will provide an in-depth guide on how to choose the perfect gun safe, along with a list of the best gun safes on the market. One of the most important reasons for investing in a gun safe is that it will protect your firearms from theft and environmental damage. Guns are a sizable financial investment, and a good safe is the only real solution to protecting that investment. Robberies happen every day, and so do home fires and floods. Purchasing a safe for the purposes of protecting your valuables from a flood or fire might not seem obvious at first, but scour the Internet and you can find plenty of stories of safes surviving through home disasters in which everything else was lost. Gun safes can also provide immediate financial savings, as insurance companies will typically agree to reduce your rates if you show them that you're keeping your firearms locked in a safe. Gun safes also ensure that your firearms won’t accidentally fall into the hands of children or loved ones who might endanger themselves or others. We’ve all heard unfortunate stories in which guns were stored improperly, got into the hands of a child or a family member who was ill, and it cost someone their life. These events are tragic, especially because they can be so easily avoided. This ties into the importance of purchasing a safe to ensure personal accountability over your firearms. As a gun owner, your gun is your responsibility. If your gun somehow gets into the hands of someone who uses it to commit a crime, you could be held accountable. With a gun safe, you can sleep easy at night knowing where your firearms are and that they are secure. At the end of the day, there is absolutely no reason not to invest in a proper safe. We know choosing the right gun safe is no simple task. Gun safes are expensive, and the selection available is extraordinary these days. So accompanying this list of the best gun safes, we have included a buyers guide to help give you a clearer sense of what you should be looking for when finding one that best suits you. There is a lot of information to cover, but we encourage you to take your time going through this guide and use what we’ve laid out here to help in your future purchases. With that said, let’s get started. We have divided our product recommendations into 3 categories: handgun safes, long gun safes, and hidden safes. Handgun safes are typically small and are designed to hold somewhere between 1 to 3 pistol-sized firearms and a couple of extra magazines. Long gun safes are larger and can house several rifles in addition to a lot of extra gear and ammunition. Finally, hidden safes feature clever designs, which hide your firearms in places where no one would ever think to look. Among these different types of safes, there is a variety of advanced features, building designs, lock styles, and security upgrades available. But choosing the right-sized safe is typically your first priority. It’s recommended that you don’t just account for the guns you currently own when buying a safe, but rather the guns you plan to own as well. For example, if you only own a couple of pistols at the moment but plan on getting several rifles in the future, it would be best to get a full-sized long gun safe where you can store both your pistols and your future rifles. Similarly, if you only own a few rifles at the moment but one day might own dozens, then you should consider planning ahead and getting a really big safe. Also, bear in mind that gun safes can store more than just guns. You might want to consider if there are valuables you would want to store in your safe along with your firearms and factor the additional space that those valuables might require into your decision. Generally speaking, it’s wise to get a safe with twice as much space as you think you might need. Finally, before making your selection, be sure you have measured the area where you plan to put the safe to ensure that it will fit. Now let’s turn our attention to what exactly makes a great gun safe. As mentioned in the introduction, protection against theft and break-ins is generally the primary security consideration when choosing a safe. However, environmental protection should also be considered. Most safes will come with a fire rating, which will detail maximum temperatures the safe can withstand while still protecting its contents. Top-tier safes are often fire rated up to 1,400 degrees Fahrenheit for at least half an hour. This should be more than enough, as typical residential fires don’t exceed 1,200 degrees. You also want to be sure that your safe protects against humidity and flooding, although this is common with most safes. Let’s talk about safes' security specifications. This is the information that you will need to know to ensure that it’s impossible for your safe to be cracked. First, you will want to know the steel gauging of the safe. Steel gauge thickness is measured somewhat counterintuitively: the lower the gauge, the thicker the steel. For example, 14-gauge steel is thinner than 8-gauge steel. The thicker the gauge, the better, and for large, heavy-duty safes you will want a minimum of 8-gauge steel. This provides a level of thickness that will make it very difficult for a would-be safe-cracker to penetrate. When reading about safes, you often come across a term called "RSC" (Residential Security Container). RSC is an indication that the safe has been laboratory tested and was able to withstand a break-in attempt using screwdrivers, hammers, chisels, pry bars, etc. for at least 5 minutes. Door thickness is also important. To ensure that the door can’t be pried open, it’s recommended that a safe door be more than 5/16” thick and have a pry-resistant design. A steel door is also preferred, as it will do a better job withstanding heat from a potential fire. Other factors to consider include the thickness and durability of the bolts, the access speed of the locking mechanism, and the mounting system and anchors. A safe’s bolt system is used to lock the door to the body of the safe. It’s best to have a multi-bolt system, and if you find a safe with say, a 10-bolt system, that is preferred to a simple 2-bolt system. You also want to consider the time it takes to disable the locking mechanism. This is important because if you need to access your gun from your safe in a self-defense scenario, you will need to be able to do so quickly. Depending on your needs, you might want to avoid purchasing a safe with a traditional combination lock in favor of a quick-access biometric fingerprint scanning system. Alternatively, there are safes with RFID (radio frequency identification) signals or Bluetooth smartphone systems that can work equally well. All of these design details will be covered later in this article along with product recommendations for each. That brings us to mounting systems and anchors. A safe needs to be protected against being broken into, but you also want to ensure that it can’t simply be picked up and carried away. This won’t be an issue with larger safes, but if your safe is light enough to be carried away, then you will either want to have it properly mounted or anchored. With this in mind, you want to purchase a safe that comes with pre-drilled mounting holes and bolts. Finally, you likely will want a safe that comes with an alarm system and is equipped with a fail-safe locking mechanism. Alarm systems will be triggered after a certain number of incorrect combination inputs or if someone attempts to move the safe. Fail-safe locking mechanisms, meanwhile, will render the safe inaccessible for a period of time if the wrong input code is entered multiple times. Many safes nowadays come equipped with sophisticated electronic locking mechanisms, like biometric fingerprint scanners, RFID signal activators, and Bluetooth communication. Electronic keypad mechanisms are also extremely common. These systems are typically very easy to understand and operate, even for less tech-savvy users. But if you are more mechanically minded, you can opt for a safe with a traditional mechanical lock. While electronic locks have obvious upsides, you need to be aware that they also come with their drawbacks. Namely, electronic safes require batteries which will die and need to be replaced. Most safes use traditional easy-to-replace batteries like AA or 9V, but just be aware that you will need to manage your safe’s battery life should you choose to go with an electronic lock. If you choose to use a mechanical safe with a manual key, you won’t need to worry about dealing with batteries. However, you will lose out on convenience, and you will not be able to access your safe as quickly in the event of an emergency. You might also consider getting a combination mechanical safe, but this will be even slower, and you will be responsible for remembering your combination. It’s wise not to have your combination written down anywhere and to instead commit it to memory. If you do insist on having your safe combination written down, don’t label it “Safe Combination” on the document you write it on. Ultimately, the choice between a mechanical and an electronic lock comes down to personal preference, but you should at least clearly understand the tradeoffs. Nowadays, you can get safes with both an electronic key and a backup mechanical lock; so bear that in mind also. The information given above should be more than enough to get your going, and as we go through our list you will get a clearer sense on what type of safe might be best for you. With that said, let’s take a look at the best gun safes on the market. When it comes to vaults and safes, there are a few brands that stand apart from the competition, and Fort Knox is one of them. Let’s kick off our list with the classic Fort Knox Pistol Box—a 10-gauge steel-bodied safe with a 3/16” plate door and an antique silver-textured powder coat finish. The door is held in place by a four-bolt system, and it features a Simplex 5-button punch lock, which is easy to use and quick to access. The interior of the Pistol Box is lined with foam, with internal dimensions of 3 5/8″H x 8 1/4″W x 10 1/4″D— enough to fit a single handgun and some extra magazines. The Pistol Box is backed by a lifetime warranty and is generally considered to be one of the most secure boxes on the market today. It’s ideal for a bedside pistol safe or for mounting in your car. This is one of the higher-end small handgun safes on the market and the quality is undeniable. The GunVault NanoVault 300 is a popular budget gun safe ideal for portable use. It only weighs 3 pounds and is also TSA approved for travel. Its interior dimensions are 1.5" x 6.25" x 9.25". There are no bells or whistles with the NanoVault. It uses a simple, easy-to-operate Key Lock System, and the interior leaves you just enough room to hold a small pistol and an extra magazine. It also comes with a 1500-pound-tested security cable. While this shouldn’t be your go-to gun safe, the NanoVault certainly has its use cases, most specifically for travel. And for under $50, it’s a great budget item. Hornady’s RAPiD series offers a range of high performing safes with great aesthetics and cool high-tech features. The RAPiD series safes come in several variants, ranging from traditional handgun safes to special vehicle safes—complete with inflatable mounting systems. As the name implies, RAPiD Gun Safes allow for rapid access by using RFID activated wristbands, key fobs, or decals/stickers, which instantly open up the lid when waved over the safe. The safes are battery powered but also have AC plugins to ensure you can always get access. The safe lid also has a numbered keypad for entry in the event you don’t have your RFID device on hand. I highly recommend checking out the Vehicle Safe if you are in the market for something for your car or truck, but for now let’s turn our attention to the 4800KP model. This safe is made with 14-gauge steel and has enough internal space for two 1911 pistols. It uses the RFID activation system, and you can program up to 5 different tags. I’d recommend programming a bracelet and putting a sticker on your phone as a backup. The safe is held together using two internal hardened locking lugs, and the lid features a six-digit numbered security code panel for alternative entry. As mentioned above, Hornady offers a wide range of products, including AR Gun Lockers and Shotgun Wall Locks. They also have biometric safes and traditional key safes. I’d personally stick with the RAPiD safes, as the RFID technology sets it apart from the competition, but I’d recommend checking out their entire catalog, particularly if you like cool tech. If you’ve ever wanted to be like one of those badasses in the movies with a secret desk compartment with a handgun in it, look no further. The GunVault SpeedVault is a nifty little electronic safe that mounts under your desk (or anywhere else) and allows for quick access in the event you need to flex your muscle during a business deal. I kid, of course! But nevertheless, this is a damn cool little safe. The SpeedVault is an electronic safe that uses GunVault’s patented No-Eyes simple four-digit keypad for quick and easy access. It’s made with 18-gauge steel and uses a single 9V battery. The interior of the safe is foam padded and about the size of a holster—just enough for a single loaded handgun. While it shouldn’t serve as your main gun safe, it is a great novelty item and could certainly come in handy. There isn’t much else like it on the market today. Lastly, they also offer a biometric option that uses a fingerprint scanner that holds up to 20 individual fingerprints. Biometric fingerprint safes are about as cool as it gets. Barska’s Biometric Safe series offers a wide range of fingerprint-scanning safes that have established a solid reputation for themselves in today’s gun community. On average, it takes about 2 and a half seconds to unlock the Barska Biometric Safe, and it’s capable of storing up to 30 fingerprints on its internal database if you want to add additional access for loved ones. The interface is extremely simple, with a 1-button locking system. The safe uses AA batteries, and the average life expectancy of the batteries is 1 year. It also comes with backup keys and there’s a hidden keyhole on the safe for alternative access. The Biometric safe is DOJ approved for firearm storage and has an automatic open door alarm for added security. It also comes with mounting hardware and pre-drilled mounting holes in the body of the safe. As mentioned above, Barska makes a wide range of different-sized safes, including single-handgun safes, multiple-handgun safes, drawer safes, and wall safes. They also have a solid rifle safe, which we will be touching on shortly. The safes are also quite affordable, with most models costing under $300. There are some drawbacks, however, in that these safes aren’t fireproof and don’t have the heavy-duty construction you might be looking for out of a primary gun safe. That said, these safes are great for their quick access and are certainly a bargain all things considered. Let’s start looking at long gun safes now, starting off with the 7550 Supreme Rifle Safe from Paragon Lock & Safe. This 102-pound 18-gauge steel safe includes an 8-gun rack and comes with a 10-year full warranty. The safe’s dimensions are 55”x19 ¾”x11”, and it uses a simple lock and key mechanical access system (2 sets of keys included). The base of the interior has a gray carpet mat padding and the exterior is black with a beautiful golden stag design painted across the door. There are pre-drilled holes for anchoring, and the anchor bolts are included with the safe. The 7550 Supreme Rifle Safe meets a reasonable price point, well under $500. Its durable design, along with its beautiful aesthetic, makes it a great choice for those looking to not spend thousands of dollars on a good long gun safe. Barska’s Large Biometric Rifle Safe is an affordable compact safe that uses the same biometric identification fingerprint scanning system as the Barska Handgun Safe we reviewed earlier. Using the biometric scanner, the safe can be accessed in 2.5 seconds, and the safe’s internal database can store up to 120 fingerprints. There’s also a hidden keyhole, which can be accessed with backup keys included with the safe. The safe runs on AA batteries, and typical battery life is around 1 year. It also comes with an emergency backup battery pack to help ensure you will never be locked out of the safe in a pinch. I really like the compact design of this safe. It’s a great choice for someone looking for secure rifle storage who doesn’t want to have an enormous safe awkwardly placed in the corner of their bedroom. The Barska safe can be discreetly placed in a small closet, which I really appreciate. The safe pictured above is designed to hold up to 4 rifles, though they also offer larger options. It also comes with a removable accessory shelf for ammunition storage. The door is designed with tamper-resistant inner edges, and the safe comes with complete mounting hardware and pre-drilled mounting holes. When it comes to biometric safes, Barska is hard to beat. Their technology is reputable, reliable, and very affordable. Many of their safes are priced under $500. The Paragon and Barska safes are great, but they don’t feature the ultra heavy-duty design you might want if you are looking for a top-of-the-line safe that can store a sizable gun collection for a lifetime. With that in mind, let’s turn our attention to some giant safes that are impenetrable and virtually indestructible. The Rhino A7256XGL is a whopper of a safe with a hefty price tag to match. Its dimensions are 72”x56”x27” and it weighs 1,580 pounds! Literally everything about this safe is top of the line. It’s constructed with 10-gauge steel and has a ¼” solid plate steel door. It offers fire protection for 120 minutes at 1,400 degrees Fahrenheit, comes with over 10 layers of advanced protection fireboard built into the interior, and features a heat-activated door seal which expands to 7 times its size around the edge of the door to keep out heat and smoke. The Rhino A7256XGL comes with a mechanical manual lock or an EMP-resistant electronic D-Drive number padlock for an additional $160. The door uses a 16-door-bolt design and a ball bearing drill plate. The safe itself holds up to 68 long guns & 10 handguns. The interior also features LED interior lighting with an infrared motion sensor. There is a massive list of additional features that come with this safe, but I’ll wrap things up by touching on the extensive customization options for the safe’s storage and aesthetic. For one, you can purchase a swing-out long gun rack and a padded door organizer for easy gun management. Additionally, you can choose between a heather or leatherette interior and 5 different gloss exteriors. Finally, the trim of the locking mechanism comes in 4 different colors, and you can choose between 3 different textured exteriors. The Rhino A series comes with smaller variants, but I wanted to focus on the largest in the series as a prime example of something a serious gun collector might choose for a lifetime safe. The safe is, for all intents and purposes, indestructible and big enough to house a sizeable gun collection. You may wind up spending north of $6,000 if you decide to purchase a fully upgraded model, but it’s a one-time investment that will ensure your firearms will be protected forever. I’m in the process of moving as I write this and my intention is to buy my own Rhino A7256XGL very soon. Let’s redirect our focus onto a large gun safe that offers space and security without the $5,000+ price tag. The Steelwater Standard Duty 16 is 59”x22”x16” and has a maximum capacity of 16 long guns. It also features a number of upgraded features like an EMP-protected digital keypad lock, a heat-activated door seal, a fully carpeted and upholstered interior, LED lighting, and a free door organizer for handguns and ammunition. It’s made with 14-gauge steel and is fireproofed at 1,875 degrees Fahrenheit for one hour. The 5-inch-thick door contains two layers of fireboard, and the entire interior is lined with double-layer fireboard as well. The door is held in place by a 14-bolt system, and there is a spring-loaded re-locking bolt built into the safe in case the lock is ever punched out during an attempted break-in. The safe also comes with an emergency bypass key. The Steelwater Standard Duty 16 weighs 330 pounds and comes with pre-drilled anchor holes. A two-section gun rack and 4 adjustable shelves are also included. The safe is priced under $1,000 —a great deal considering its size and quality. We will be rounding out our top long gun safe list with two of the most trusted brand name manufacturers in the business—Liberty and Winchester. Liberty offers an impressive selection of large long gun safes, and if you are looking for something with comparable heavy-duty security to the Rhino A7256XG, I’d recommend checking out the Liberty Presidential. It’s an amazing safe built with 7-gauge steel and offers 2.5-hour fire protection at 1,200 degrees Fahrenheit. The Presidential safe can also hold up to 39 rifles. Of course, this all comes at a price, as you will likely be exceeding $5,000 with the purchase. Instead of focusing on Liberty’s most heavy-duty safe, however, I would prefer to focus on their number-one-selling product—the Fatboy. Like the Rhino A7256XG, the Fatboy can hold over 60 long guns (64), but at a price point starting at $2,200, which is better suited for more people’s budgets. The Fatboy is built with 11-gauge steel and is fireproof for 75 minutes at 1,200 degrees Fahrenheit. It also features a heat-activated door seal and triple-layered fireboards in the door, ceiling, and walls. The safe’s dimensions are 60.5”x42”x32” and it weighs 895 pounds. The interior is upholstered with gray fabric with black trim and uses a Brightview wand battery-powered light kit. The Fatboy’s security is exceptional. It features 4-inch military-style locking bars, making it impossible to pry open, and comes with either a UL Listed Sargent & Greenleaf mechanical lock or a SecuRam Prolegic electronic lock. Finally, the Fatboy offers numerous add-on features, including Flex interior center dividers, 3 gun racks, and a 10-pack Rifle Rods starter kit. You are also given various exterior and interior finish and fabric options. Rounding out our long gun safe list, let’s take a look at the Big Daddy XLT from Winchester. This 1,080-pound 12-gauge steel safe is 72”x42x”27” and can hold up to 56 long guns. It has a 75-minute fire rating at 1,400 degrees Fahrenheit and has layered fireboard protection on the floor, ceiling, walls, and door. It uses an 18-bolt locking system, with 12 active bolts plus an additional 6 dead-locking bolts which engage during an attempted break-in. Like the Fatboy, the Big Daddy comes with either a Sargent & Greenleaf mechanical or an electronic lock. Winchester also provides a lifetime warranty and replacement guarantee. The Big Daddy’s price begins at $1809.99 and is available in a gunmetal or black finish. It comes with an adjustable shelving system along with auxiliary shelves and Collector Racks. It also includes a door-lining handgun and accessory holder sheet, complete with thermal-protective zippered door pockets. The interior also features motion-sensing LED lighting. Now that we’ve listed off some of the very best handgun and long gun safes on the market, let’s check out some really nifty hidden safes. The benefit of a hidden safe is that it can be concealed in plain sight, thereby reducing the likelihood that the safe’s contents will be stolen in a break-in. They can also help ensure that you have quick access to a firearm in places where you wouldn’t normally have a gun around. A hidden safe can have a lot of utility, but it probably won’t be your primary safe, especially if you have a larger gun collection. Hidden safes also tend not to have as strong of security and environmental protection features as traditional safes either. But now that we’ve established hidden safes’ pros and cons, let’s take a look at some of the best on the market. Hidden wall safes are the most common type of hidden safe. They tend to have a shallow dimension design and are mounted into a cut-out section of wall somewhere in your house. In plain sight, the safe can be obviously recognized. However, the objective is to choose a location in your home where no one would think to look. Good examples of where you might install a hidden wall safe are in the back of your closet, behind a closet door that blocks the safe from view when you walk in, or behind a mirror or a piece of artwork hanging on the wall. We will be looking at hidden wall safes from two different manufacturers—Paragon and Viking Security. Let’s first check out Paragon. Paragon Lock & Safe’s 7750 Deluxe Wall Safe is an excellent electronic safe made from ⅛” thick steel. It features a numbered keypad lock, but the safe can also be accessed using keys provided with the safe. The safe weighs 39 pounds and its dimensions are 22”x16 ¼”x4”. Installation is simple and there are pre-drilled anchoring holes along with anchor bolts included. The interior provides sufficient room for a few handguns, ammunition, and whatever valuables you might want to keep safe. The exterior has an off-white finish. Viking Security’s VS-52BLX Hidden Wall Biometric Fingerprint LCD Keypad Safe is a great choice for those preferring the quick-access ability of a biometric scanner. The Viking Security Biometric Safe weighs 39 pounds and its dimensions are 19”x14”x4”. The biometric scanner is able to store up to 32 fingerprints and there is also a keypad for backup entry. 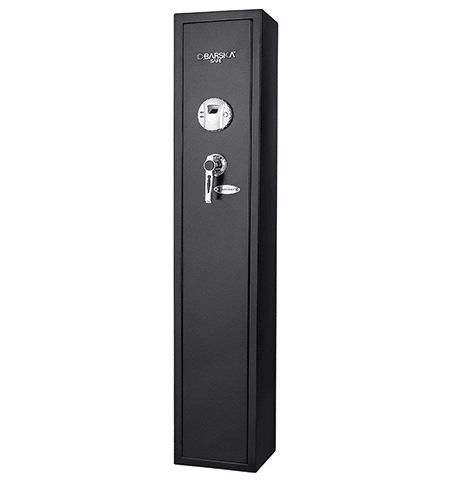 The Viking Biometric Safe comes with a number of security features built into its design, including a pry-resistant door, solid steel locking bars, and a timeout lock shutdown if incorrect codes are repeatedly entered. However, the safe’s steel gauging is unspecified and it is neither fireproof nor waterproof. The safe comes with mounting anchor bolts, pre-drilled anchor holes, and an interior LED light. It has an all-black finish. With hidden wall safes covered, let’s move on to some of the more badass hidden safes on the market, beginning with Liberty Home Concealment. These hidden safes don’t offer much in way of break-in protection, but the designs are extremely clever. Liberty Home Concealment offers a wide range of products, including wall-mounted wood carved American Flags with a hidden gun compartment, trap-door end tables, dressers, and coffee tables, plus hidden-gun lamps, coat racks, clocks, mantle pieces, and wall art. All of their products have a beautiful look, with detailed craftsmanship, and the prices are pretty affordable too. Most of the smaller items like simple wall art, lamps, and mantle pieces cost less than $200. The larger pieces of furniture start at around $200 and go up to $750 for the large hidden gun storage shelf, capable of holding 2 long guns and several handguns, plus ammunition. All of the compartments have foam-padded interiors, and depending on the design, you might want to make custom cutouts to fit your firearms. As far as locking goes, all of the products come with an optional RFID key-card lock upgrade, which I would highly recommend. This provides added security and allows for instant access in the event of an emergency. These products are incredibly badass, and to get a full video demonstration, I’d recommend checking out Liberty Home Concealment’s YouTube channel. Last but not least, let’s take a look at the concealed gun compartment lineup from Tactical Walls. This is another awesome company with all kinds of cleverly designed contraptions, which include trap door coffee tables, concealment safe wall-mounted mirrors, wall art, shelves, secret compartment clocks, and more. Tactical Walls products are a little more expensive than Liberty Home Concealment, but the quality is arguably better. I really like the compartments’ interior designs, as they look more cutting edge, with shelves and velcro backing to hold your firearms in place. One drawback is that the compartments are opened using an awkward set of magnetic lock openers that look like oversized chess pieces. However, you can opt to have an RFID locking key-card or fob lock system instead, which I would highly recommend. Other Tactical Walls’ products worth looking at are their concealed safe mirror and their hidden compartment shelves. The shelves range in price from $245 to $399, depending on if you choose a small single pistol shelf or a full-length rifle shelf. The concealment mirrors cost around $500. Popular YouTuber Iraqveteran8888 made a video a few years back showing off a bunch of the Tactical Walls products he has set up in his house that I would recommend checking out here. You can see the level of concealment and craftsmanship of Tactical Walls products are pretty incredible. You will also notice the odd magnetic locks, but again, it’s been addressed now with the RFID upgrade option. Congrats, you made it through the entire list! We know we went all out with this one, but given that safes are a very big deal (literally), we wanted to provide as much information as possible. Remember to think long term when making your purchase, accounting not just for the firearms that you currently own, but the ones you may own in the future, too. We hope you find the perfect safe for your needs, and if you have any questions, comments, or feedback, we are eager to hear from you. Thanks for reading and we will see you next time!